Like many other nights, we went out to get the mail. It was one of those cold damp winter nights, and the snow was just starting to fall creating a slushy drive. We don't have mail delivery to the end of our driveway, as the road is too steep for Canada Post. Instead, we drive to the end of the road where our mailbox sits with it's comrades. I sat huddled in the car, nursing my oncoming cold while my dear sweet fireman braved the weather and went to get the contents of our mailbox. He came back sporting what looked like a magazine, so I was quite excited. And then, with a flourish he produced a package. Like a child at Christmas I became very intrigued. Who was it from? What did it contain? It was addressed to the sheep farmers, and I giggled as I opened it wondering what could be inside. The most gorgeous socks! A gift from Auntie Bonnie in Vancouver. Two pairs slid from the envelope - a his and hers in rich colours. We both sat in awe of the love that poured out of the envelope along with the socks. There is something so wonderful about a homemade gift. I was so incredibly touched by this surprise. In my mind, I pictured her choosing the yarn for us, and smiling as she made us matching pairs. We arrived home and tried them on. 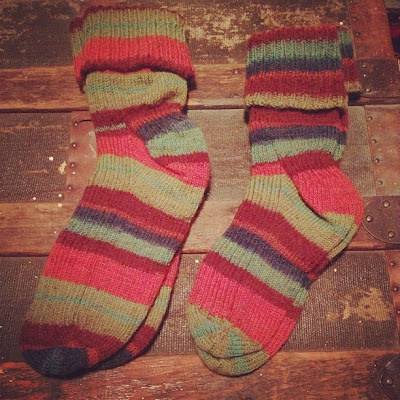 Then, like two 5 year olds, we danced around the house kicking up our heels and singing "I love my new socks! Thank you Auntie Bonnie!" There was something so wonderfully fun about these new striped socks! Her card said that they would keep our toes warm as we lambed for the first time. I don't think she realized that they also managed to make our hearts warm as well.